Take a summer stroll just about anywhere in the southern US, and crape myrtle trees stand out as icons of the lovely landscaping. In fact, they’re known as “lilacs of the South.” You may be surprised to know that they hail from the distant forests of Asia! 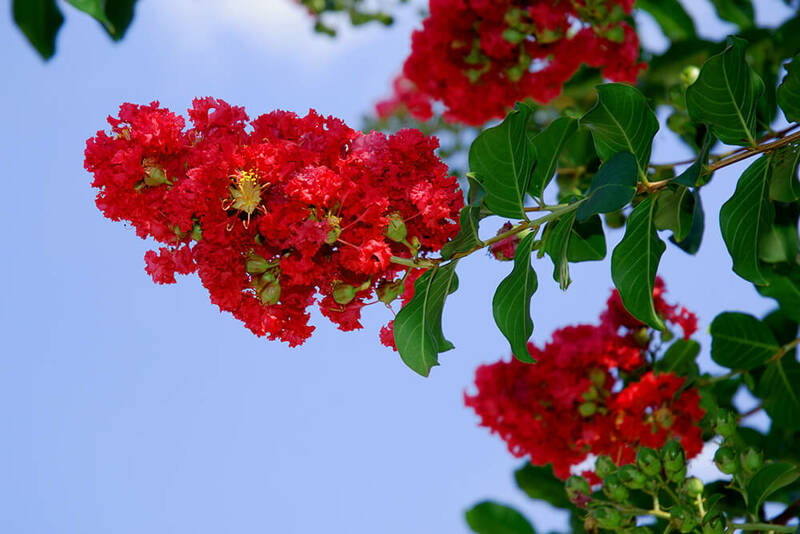 Crape myrtles can be single-trunked or multi-trunked. Some grow to 30 feet (9 meters) tall and wide, while there are dwarf varieties that stay less than 3 feet (1 meter) tall and make handsome hedges. 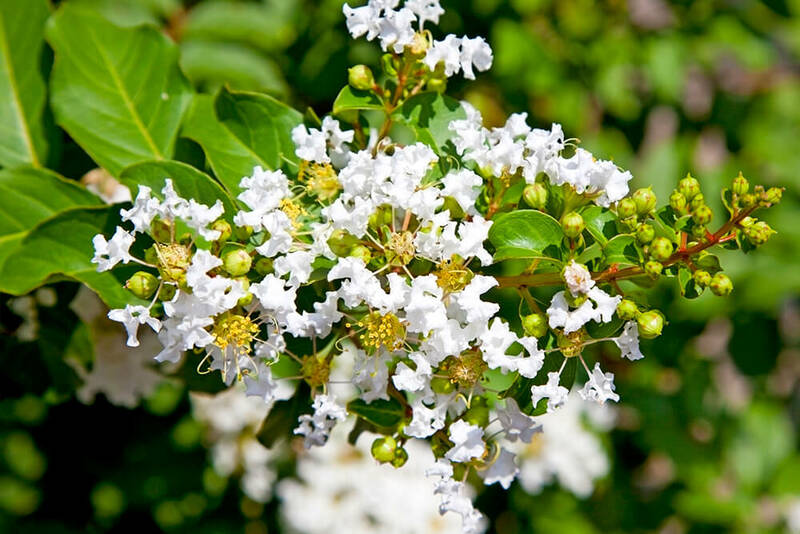 No matter the size, a crape myrtle will attract bees and birds to your garden. A crape myrtle’s glossy, dark green leaves emerge in spring. Summer heat brings an explosion of blooms that fill the tree until—and sometimes throughout—autumn. Growing in clusters called panicles, the frilly-petaled flowers can be shades of pink, purple, red, or white. When the flowers have faded, leaves give the tree another blast of beauty, turning orange, red, and yellow before falling to the ground and leaving the tree bare. But even in winter, a crape myrtle is appealing. Strips of bark flake off the tree, leaving a smooth trunk—or more commonly, trunks—that can be mottled shades of tan, pink, gray, and cinnamon. 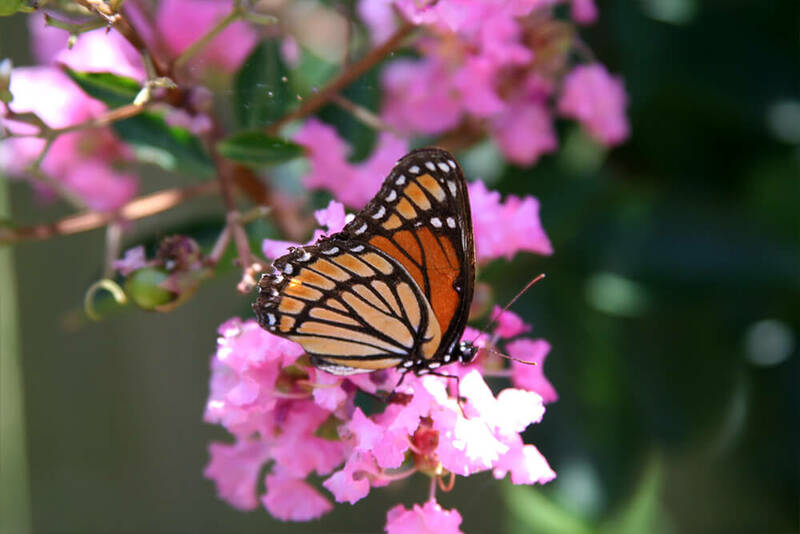 You might be thinking of cultivating a crape myrtle of your own. If you get summer heat, you might these trees and shrubs surprisingly easy to grow. They adapt to just about any type of soil that has good drainage, and they can withstand winter frost. They bloom best in full sun. Keep their roots moist for the first season, but after that, the trees are fairly drought-tolerant as long as you give them an occasional deep watering in summertime. Because they bloom on new wood, you’ll want to trim and shape them in early spring. (But beware of what aficionados call “crape murder.”) Most varieties today are hybrids developed in the 1960s, which combine abundant, brilliant blossoms with mildew resistance. It doesn’t actually kill the tree, but cutting back a crape myrtle too severely ruins its natural shape. Crape myrtles are a good choice for planting near sidewalks and homes. Typically, their roots are noninvasive and don’t tend to damage structures or nearby plants. Some of the small crape myrtle varieties grow well in containers.